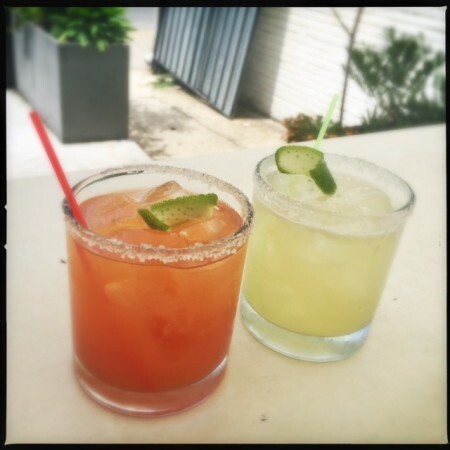 It’s easy to overlook Pancito & Lefty, a chic, cantina-style joint on upper King Street. From the outside, the windows still advertise “pizza by the slice” and it’s not entirely clear where the entrance lies. But just let your ears be your guide, and follow the deafening strains of salsa to the charming outdoor patio. 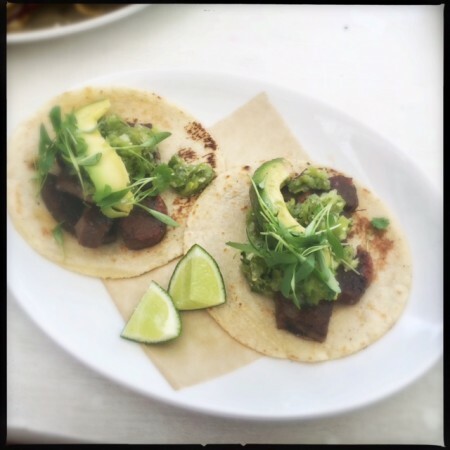 With open-air, window bar seating and the aforementioned rhythm of passion blasting overhead, Jimmy Poole and Chef Robert Berry’s restaurant is a bit like a virtual trip to a Mexican outpost, an auspicious start to a South of the Border-themed meal. But first, one must attend to the paperwork. The menu is comprised of three or four handouts, some of which fit inside each other; all of which attempt to fly off on a breeze. With beer, wine, and a variety of mezcal-infused cocktails, plus tequila, and even a flyer on the history of mezcal, there’s a lot to read — and I should mention a lot of it is in Spanish. Never one to pass up fresh guacamole ($8), the Pancito & Lefty version finds creamy mashed avocados topped with pico de gallo and “sal de chapulin” — or grasshopper salt, a traditional prehispanic seasoning. The ground bugs add a helpful salty-sour note to the otherwise typical dip. Served with a side of tortilla chips, it may seem daring, but if you can come to terms with the insect part, it’s actually quite traditional. 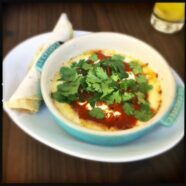 The queso fundido rajas ($9) was pitched by the personable waitress as one of the best things on the menu. Upon arrival, it’s reminiscent of a deconstructed quesadilla: A dish of melty cheese topped with spicy enchilada sauce and sprigs of fresh cilantro. Served with two crumbly corn tortillas, the actual consumption quickly turns messy and awkward. The cheese stays glued together, stretching halfway across the table as you attempt to remove a portion. Share this with someone you love or are pretty sure participates in a thorough hand-washing regimen. Mezcal is the spine around which Pancito & Lefty seems to be built, and the aforementioned handout tells of their “tight relationships with artisanal and ancestral producers.” A cousin of tequila, in which the agave is cooked in an earthen pit, I would propose that the smoky spirit is an acquired taste. To me, the Vampiro Verde ($9) — crafted with mezcal, cucumbers, and quinine, as well as verdita, a traditional tequila chaser made with herbs, jalapeño, and pineapple juice — kinda sorta tasted like Lysol. Or what I imagine Lysol would taste like. “Burnt leather aspects,” I jotted in my notes. Clearly it’s an acquired taste I have yet to acquire. Similarly, the Colata ($9), which also contains rum, pineapple, and horchata, is dominated by the smoky flavor. But the virgin housemade horchata ($3)? Ay, Papi. This is the stuff. Forget the treacly sweet, grainy beverage you’ve had before. Here at Pancito & Lefty, the thin sugary liquid is replaced by a rich beverage with excellent mouthfeel. If rice pudding was a drink, horchata would be its name. The chilaquiles verde ($12), typically a homey comfort food, are refreshing, but boring. The simmered corn chips are topped with a chunky green salsa, radishes, and crema, plus way too many thick slices of raw red onion. The over easy duck egg on top seemed so promising, but was cooked just enough not to run. And the salty cotija cheese had all landed in one corner, rendering most bites in need of seasoning. Perfectly ripe slices of avocado were an unexpected and delightful addition, but not enough to save the dish. Similarly, the el vampiro ($14) — a carne asada taco with a folded-over corn quesadilla as the shell — found tough, fatty chunks of beef where the carne asada was supposed to be. Made with (again, perfectly ripe) slices of avocado and refried black beans, it’s a smooshy mess that kind of makes you wonder where your $14 went. Cool concept, but it appears that Mexican vampires can’t be trusted any more than the Romanian version. 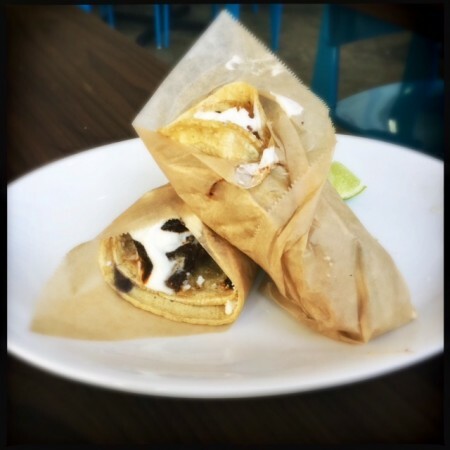 In contrast, the sope del borrego ($12) is an unusual dish that works. Stewed lamb shoulder is topped with a mint-rich herb salad, salty cotija cheese, and pickled red jalapeño. South of the Border meets Greece: Who would’ve thought? There’s a great balance of savory umami spiked with occasional moments of vivid heat. 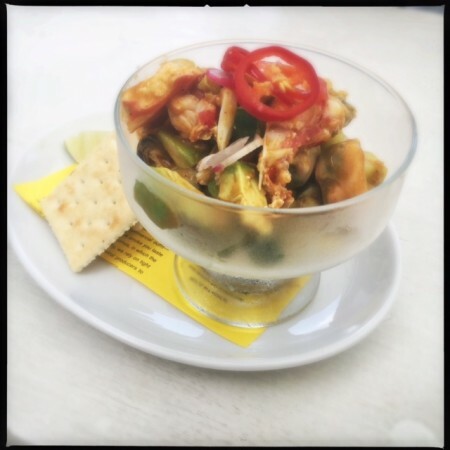 Speaking of heat, if you’re inclined toward schadenfreude, order the aguachile ceviche and get ready for a show. You’ll need to fix your eye makeup after a mouthful of this. Yes, the menu warns that it’s spicy, but that may not be a strong enough word for some palates. Four raw shrimp are tossed with lime, serrano pepper, cucumbers, and red onion. The flavors are bright, but the burn is a downright assault on one’s lips. “It’s so hot! It’s so hot!” my dining companion cried before running to the bathroom. And even five minutes later, moans of “It won’t stop burning!” and “You gotta be kidding me!” emanated from his freshly exfoliated lips. Accompanied by two fried tortillas, once you get past the aguachile ceviche’s spicy element, you realize it needs more lime and salt. All told, it tastes like … burning, with no real discernible flavors beyond heat. Add to that the fact that it’s a small portion and I can’t help but complain. Four shrimp in a $12 ceviche on upper King is no beuno. Still hoping to scratch that ceviche itch, I went with the cheerful waitress’ recommendation of the coctel de mariscos ($15). It’s a small portion, arguably too small for the price tag, and comprised predominantly of raw mussels and clams, which struck me as an odd choice. 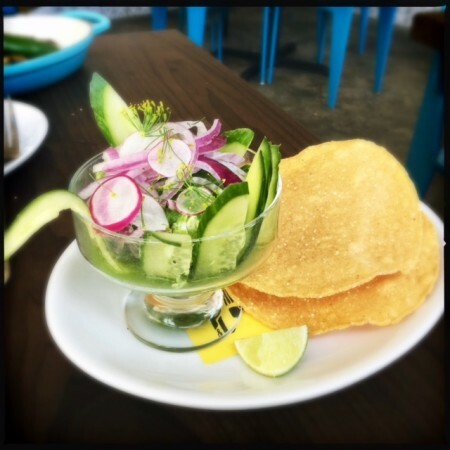 Most similar to a Nayarit-style ceviche, the tiny glass dish also offers fresh cucumber and avocado, plus a diminutive portion of crab and lobster on top all tossed in a red sauce and accompanied by a generous portion of soda crackers. I believe it’s the Colombians who tend to eat ceviche with saltines, but I opted instead for the tortilla chips accompanying the guacamole. Similarly, I would’ve preferred the more traditional shrimp or red snapper and in larger portion, but arguably I am just greedy where ceviche is concerned. The knowledgeable waiter on my second visit raved about the tacos de lengua ($8). Despite unfortunate run-ins with the organ meat in the hands of less-talented chefs, something about his enthusiasm overruled my hesitancy. And damned if it wasn’t hands-down the best tongue I’ve ever had in my mouth — in a manner of speaking. The meat is beautifully prepared, perfectly charred and tender, with none of the liver-y flavor that usually puts people off. Accompanied by a fresh tortilla, tomatillo salsa, and slices of avocado, a couple of these with a glass of horchata is the stuff of sueños. 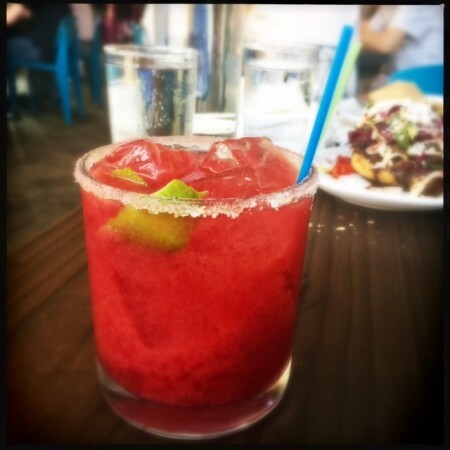 Caught somewhere between upscale tacqueria and hip mezcal bar, Pancito & Lefty still seems to be honing its focus. Granted, not everything clicks and a few items feel rather overpriced, but when the components come together, this Mexican bandit is well-positioned to steal some hearts.